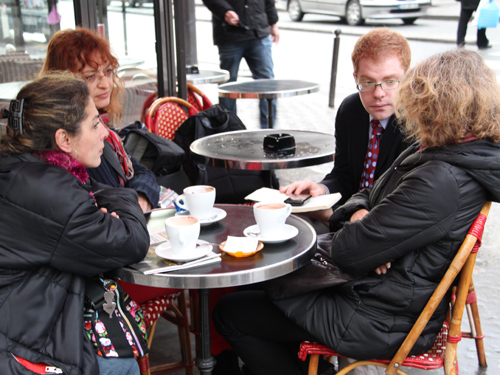 At a cafe on Avenue de Flandre in Paris' 19th Arrondissement, three women in their mid-40s sit around a small table outside, discussing their plans for dinner. They could not decide what to cook. Regardless, dinner would take significant effort. Together, Cecile, Yvone and Maria have nine children. None are married; and none are concerned about being on their own. "I met a man, we had three children, and I married after it," Yvone said. "No problem." Further down the Avenue, a mother of five -- who also works full time as an animation teacher in a high school -- enjoyed an espresso with friends. All of the women at her table had more than one child. Their story is common throughout France. According to the latest study by the French National Institute of Demographics (Institut National D'Etudes Demographiques -- INED), the average birthrate in metropolitan France was two children per woman. About 53 percent of these children were born to unmarried mothers. This is a stark contrast to the Republic of Korea, where birthrates are low, and are falling steadily. Korea's birthrates, which are too low to replace the current population, present the country with a demographic crisis. Over the four decades following the Korean War, the country's population swelled by 66 percent. In 2007, there were 7.9 workers per retiree, according to Kim Young-Iek, the former minister in charge of Korea's birthrate policy and professor at Seoul National University. Estimates for the future, however, paint a grim picture. Writing for Forbes magazine, Steven Malanga noted that data suggest the Korean population will decline by at least 10 percent over the next four decades. Those that remain will also skew older. By 2050, Professor Kim expects there to be just 1.4 people working for every retiree. Social institutions like pension and healthcare systems will, he said, have a hard time coping with this demographic change. They depend on a growing population. Moreover, according to Malanga, recent research suggests that overall economic growth is dependent as well on a growing population as well. Young Korean families "On strike"
The Korean mainstream media rarely discuss these issues. Despite the void in public discourse, Oh Yeon-Ho, the founder of OhmyNews, thinks Korean couples think carefully about how many children to have. He said their decisions are indicative of deep concerns about life in Korean society. "In essence, each Korean couple is on strike against our society," he said. "By choosing to have just one child -- or even no children -- they are saying that our society is not recommendable to future generations." According to his argument, while social issues like education costs, healthcare, and affordable housing are not often a part of mainstream public discourse, the low birthrate proves that they are on the minds of nearly all young Korean families. He says these concerns are intricately linked to a couple's decision to have children, and that it would be unreasonable to expect the Korean birthrate to rise until they are solved. To that end, for the first in OhmyNews' year-long series, "Reporting the European Dream," a team of citizens, reporters, and policy experts went to Paris to find out why French women choose to have more children than their Korean counterparts. As suggested by the INED data, France will not see the debilitating population declines expected in Korea. This is, in part, due to the systems France developed to address many of the social issues that keep Korean parents from having more children. Over the coming days the OhmyNews team will investigate how these systems work. They will describe how the French state, in conjunction with private companies and the non-profit sector, have helped to mitigate issues of healthcare, housing, education, and professional development. They will also explain the effect these programs have on the overall birthrate. As always at OhmyNews, we invite contributions of all types. If you are a French reader and would like to contribute, or you live elsewhere and have a question you would like our team to investigate, please write to us on our International email: internews@ohmynews.com.